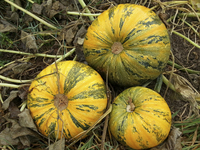 Hulless pumpkin seed originated in the Styrian region of Austria, resulting initially from a chance mutation, and selection thereafter by pumpkin oilseed producers. Many Austrian strains have been developed, and a Japanese selection (‘Kakai’) is widely grown. Because they have no protective seed coat, these seeds must be handled carefully in planting, or they will be broken in the process. Germination is improved by laying the seed between moist paper towels for 24 hours before planting in soil or mix. We got 90% germination in the field using this method last year.